No matter the length of the article, the most important words are the ten or so that make up the headline. Headlines are important for every form of media but they take on extra significance for internet channels. On newspaper and magazines, even if the headline doesn’t attract the reader, they may be drawn by the cover photo, pull quotes, or even the length. Internet channels rarely get more than a headline and a snippet to gain the reader’s attention. 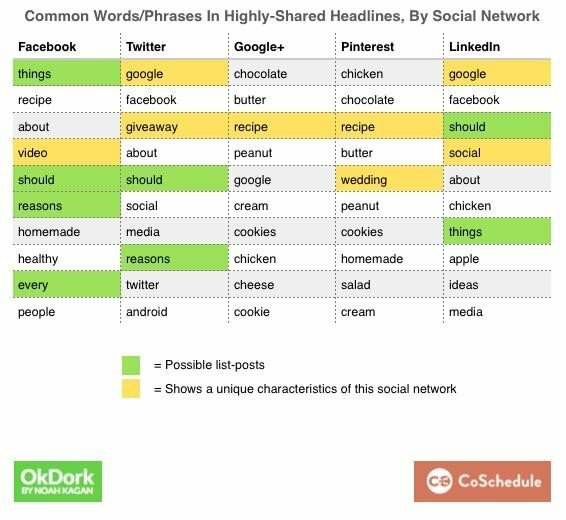 To help bloggers write better headlines, CoSchedule analyzed over a million headlines used by their clients and analyzed which got shared the most. Here are five tips for writing better headlines based on their report. One of the first things the study did was confirm a tip that was mentioned in a previous article on this site. People like to click on list posts and posts with numbers. The CoSchedule data showed just how popular list posts can be. No only were they the most likely type of post to be shared more than 1,000 or even 100 times. Though one may think this is means list posts are overdone, CoSchedule found that list posts only made up 5 percent of the total posts actually written. It’s true that not every post can be a list post, some content doesn’t lend itself to the format, but whenever possible, content marketers need to squeeze in as many lists as possible. One of the more interesting things this study did was use the Emotional Marketing Value Headline Analyzer from Advanced Marketing Institute. This tool analyzes the “emotional” factor of a headline by counting the number of emotional words that are used. The analyzer ranks headlines based on their percentage of Emotional Marketing Value (EMV) Words. It’s helpful to have a baseline, so know that the English language contains approximately 20% EMV words. Professional copywriters’ headlines will have 30%-40% EMV Words in their headlines, and some of the best copywriters will have 50%-75% EMV words in their headlines. essentially, the researchers showed there was a direct link between the number of emotional words used in a headline and the likelihood it will be shared more than 1,000 times. Going back to the list of common headline words seen before, some may have noticed that each network focused on different areas. Marketers should tailor their headlines to appeal to their target audience and the channel they are using. For example, the study found that Facebook and Pinterest tended to be home-oriented (with words like “cookie” and “recipe” on their lists), whereas Twitter and LinkedIn tended to stay more business focused (which had words like “ideas”, “Google” and “social media”). For bloggers who have the time, distribution software can be used to tailor each headline for the distribution channel. Finally, writers should make their headlines show the benefit to the reader. Contests are an extreme example of this because they blatantly tell people that they can benefit by paying attention the headline. Consumers are also interested in learning things that will help them. This is why words like ‘free,’ ‘giveaway,’ and ‘how to’ often show up in highly shared headlines. If people find the content useful, they will be more likely to share the content with others. Additionally, posts that used words like ‘you and your’ in their headline performed extremely and were shared frequently. In contrast, posts that used ‘I and Me’ we three times less likely to be shared. The point is clear, focus on the benefit to the reader. Headlines can be tricky because so much depends on few words that marketers pick. Because this is a challenge that marketers and bloggers must rise to, because headlines are everything in the world on internet marketing. For more tips on creating sharable content, read this article on our site.